The Displaced Q: Can travel and the expat life lead to a healthier diet? Part of the formula for feeling better about oneself — TDN’s theme this month — is eating a healthier diet. Today Tony James Slater, the newest addition to our team, poses a Displaced Q on the eating habits of travelers and expats. I think I have what you might consider to be a rather controversial point of view, which is that traveling and leading an expat lifestyle can lead to a healthier diet — but for the most part do not. WAIT! Before you hit the comments with that vitriolic reply — hear me out. I may be wrong (my past wrongness is legendary), but I believe I have a point. Tell you what — I’ll lay out my opinion (which I’ve put a lot of thought into), and then you can tell me if I’m talking out of my asparagus. Chopping veggies: too much like hard work? Plenty of people see travel as a way to reinvent themselves. I should know, I did exactly that, as explained in my last post about volunteering in Ecuador. But reinventing your lifestyle is one thing — your diet is something else. I think statistically speaking (and I’m no expert) 99.9% of us have struggled with our diet at some point or other. It’s not a change like deciding to make more “me time,” or adding the beach into your daily itinerary. We struggle because changing our diet requires that dreaded thing: commitment. And the enemy of commitment is convenience. Ah, convenience…the single biggest factor driving the fast-food phenomenon worldwide. Is it easier to swing past KFC on your way home from work than it is to get home and start chopping vegetables? What’s more, this instant gratification factor appeals not just to the terminally lazy — like me — but to an awful lot of people in a world where free time is increasingly under pressure. So you’re in a new country. You tour the neighborhood. What’s the first thing you’ll recognize — whether in Cairo, Bangkok, Buenos Aires or Paris? Chances are it’ll be a fast-food joint. It’s just so easy. Nothing new to challenge you — either your palette or your linguistic skills. Just point and grunt, to be rewarded with something you could have bought within five minute’s drive of the last place you lived. Still, there is the part of me that, after a few days dining from street vendors, really craves a burger. Or a pizza. Something Western, that tastes of home. The trouble with eating Italian food is that five or six days later you’re hungry again. There are certain countries with a deserved reputation as a mecca for healthy eating — yes, I’m talking about Japan here. In fact, most Asian countries are considered to have a healthy yet appealing diet, with an emphasis on seafood and simplicity. For the better part of a year in Thailand I lived like a king. Fresh fruit for breakfast every morning, compared with jam on toast, bacon and sausage back home — score one for healthier eating! Simple meals of chicken and rice, or noodles from street vendors were my staples. They were as cheap as they were delicious! And yet… It was all fried. The rice was fried. The chicken was fried. The noodles… Is it possible to overdose on MSG? I had no control over how my food was cooked and no kitchen to prepare it myself. Back home I fry things occasionally, but I’m a path-of-least-resistance kinda guy. My food isn’t always healthy (burgers, schnitzels, chips) — but I’d stick it in the oven or grill it. So the score…is tricky to say on this one. Thailand is famous — at least amongst the 18-35 age group — less for its culinary marvels than for its parties. Score one (a large ONE) + a whisky chaser for the unhealthy diet. In my experience, to eat anything decent, you have to work for it. The easier food is to find, and the more recognizable, the less healthy it tends to be. If you’re prepared to experiment with different recipes and ingredients, different cooking apparatus and utensils, to learn a few words in the local language and risk using them in the market — then you can manage it. But if you’re prepared to do all that for the sake of eating healthy, chances are you do it at home too, in which case you’ll eat healthily wherever you are. And probably outlive me by at least a decade. So, as I said at the beginning: can travel encourage one to adopt a healthier diet? Well, I think it can…but doesn’t. Am I full of carp? Am I talking sushi? What do you think? TONY JAMES SLATER is a self-confessed adventureholic. For the last six years he’s been traveling nonstop around the world, working at a variety of jobs including yacht deliverer in the Mediterranean, professional diver in Thailand and snow boarder in New Zealand. He even deprived the world of sandalwood one tree at a time in Australia (though he still maintains it was an accident). Last year, Slater published his first book, That Bear Ate My Pants!, an account of his misadventures while volunteering at the animal refuge in Ecuador. (The book was featured in The Displaced Nation’s list of 2011 expat books.) He is currently working on a second book set in Thailand, while exploring his new home in Perth, Australia. STAY TUNED for Wednesday’s post, an opinion piece by Lawrence Hunt on what drives today’s young people to seek spiritual enlightenment abroad. 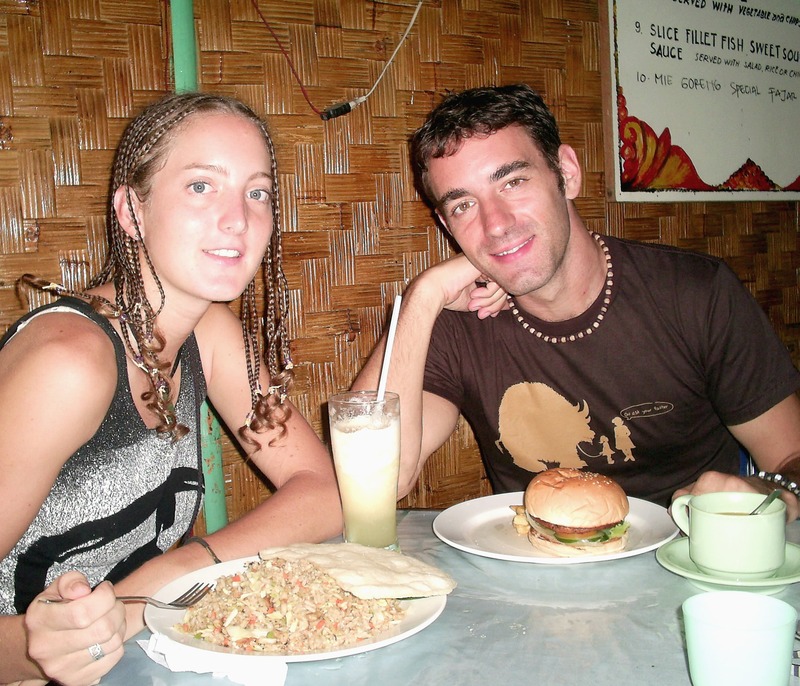 Image: Tony Slater with his girlfriend (now wife), Krista, in an open shack-style cafe in Kuta Beach, Bali, Indonesia. Krista is eating nasi goreng, a Balinese veggie curry (over fried rice), whereas Tony has ordered a burger (but will it be too Asianized for his tastes?). I would hazard a guess that in all the traveling around you’ve been doing you’ve probably shed a few pounds despite yourself, right? I’ve found that living in Thailand has helped us eat a lot healthier (for the reasons you’ve already stated). Even though food is fried (i.e. tossed in a pan over some form of heating device) it’s not the same as the ‘fried foods’ of the western world…typically battered and deep fried or fried in lots and lots of butter. The oil that is used here is generally healthy and usually used sparingly. The resulting dish is of lower fat content than the Cesar salads I used to eat in North America. We do give in to the odd craving for pizza occasionally… The Pizza Company in Phuket makes the best pizza ever! Both my husband and I have lost weight since moving to Thailand and those street vendors are closer by, more convenient and much cheaper than the ubiquitous fast food (which wasn’t the case when we lived in Dubai and packed on several pounds). I think Anne has a point. Indeed, my experience was the opposite of the one you describe — maybe because I originated in the land where fast food was born. It’s easy to get fat in America, and I was happy that my travels removed me from temptation. Mind you, my first port of call was England, where the food didn’t tempt me at all. But that was fine — I just ate less, learned what it meant to eat to live. I also got more exercise since I was no longer going everywhere by car. Despite developing a sweet tooth to compensate for the boring diet, I lost quite a bit of weight. All in all, I think my expat life led to a big change in diet as well as lifestyle. Even though I’m now back in the US, I can’t get back into the way of eating at all. Thank goodness I live in NYC, near a Japanese grocery store and green markets galore, meaning I can still eat the way I did abroad. And I still walk everywhere, of course. I have to admit I lost weight while living in Thailand – I put that down mainly to diving for a living, doing a lot of heavy work carrying tanks around etc – though I imagine I ate quite a lot less just because it was so hot all the time! But I’m a lover of ‘comfort food’ – whenever I’d dealing with tricky stuff, like moving from place to place or looking for work somewhere I shouldn’t, I tend to reward myself, or give in more easily, to the temptation to eat something really delicious. Which, 9 times out of 10, contains enough calories for three days! I have to say that Brazil fixed a lot of my eating habits. For one, eating out can generally be pretty healthy. Upon moving here I improved greatly. Prepackaged anything is very expensive. I started cooking basically everything from scratch. I am around 10 lbs lighter here without any effort. Awesome! There are plenty of countries where this must be true – the more packaged and processed, the more expensive, which I guess would kind of persuade you to eat simpler, healthier food to save money! That’s a great motivation, and the opposite of what happens in a lot of western countries where ‘health food’ or fresh produce is generally more expensive as it’s considered a lifestyle choice… And of course if you’re in Brazil, you could always get involved in some Capoeira! We eat fairly well in our house. A Mediterranean diet; I’m not sure though how much it has to do with our being in Spain – we had a Mediterranean diet in Ireland! It’s just the kind of food we both like. Fresh and cooked from scratch. Cooking is a de-stressing activity for me after work so we don’t eat processed food or fast food. You couldn’t tempt me with KFC or a McBurger. I’m afraid it all seems like muck to me. Aye, there’s the rub! Beer…. ah well. You can rest safe in the knowledge that you’re not alone on that one. But you see, a healthy diet where you prepare everything from scratch – in Ireland, where folk mostly eat potatoes – puts you into the category of ‘full-time healthy eater’ – as opposed to someone who started eating healthy as a result of travel! I gotta stick to my guns on this – it’s possible to eat healthy even in England if you try hard enough (and earn about twice the national average) – but few foreigners visit the UK and find it drastically alters their diet fo the better. Is there anything other than an extended sojourn in Japan eating watery soup and raw seafood, that creates this kind of effect? I definitely think that the expat life (especially if you’re living in more rural or nearby agricultural areas) is a gateway to a healthier diet. Though when I travel, it’s another story. Living abroad, I tend to cook for myself a lot more and have (fortunately) gained a bit of speed and efficiency when it comes to chopping those veggies. Traveling though, is about spoiling my taste buds and trying all those new foods!!! So depending on where I am, my travel diet can be very healthy or naughtily indulgent (ideally, a bit of both!). I think that both the Asian diet and the Mediterranean diet (in my case, Mediterranean) definitely surpass the fast food joints by a thousand miles. After 5 years of Mediterranean food, I’ve never felt healthier. NOOoooo!! It can’t be true! A new country offers so many temptations, new flavours to become addicted to – and very few of them are healthy! If you moved to a new country now I feel certain you’d discover some AMAZING new dessert or rich, stodgy dish. Just like you said with travelling – who ever comes home from holiday raving about a new vegetable they’ve tried…? Great article, Tony. I’ve travelled all around with my work and there’s nothing like a dose of ‘Deli Belly’ to really help get those pounds off!! 🙂 however, as a career submariner i have to agree with one key point. We’d pop up in some foreign land and walk past every shop and restaurant to get to a MacDonalds. It’s amazing what you crave and what feels good when you’re away from home. Good to have you here, James! My partner and I both lost weight after moving to Turkey despite our best efforts to nurture a cheap drink problem. Substituting convenience foods saturated with salt and sugar and stuffed with E numbers with freshly prepared meals just might have something to do with it. We also eat very little red meat these days because it so darned expensive here. We absolutely dreaded the thought of early onset emigrey arms (a kind of muscle wasting condition of the upper limbs, brought on by over-exposure to the sun and alcohol abuse) so we developed an addiction to chocolate to compensate. Meat is expensive everywhere, and nice lean stuff even more so. Consequently I get my meat from the worst possible places – burgers and sausages – which are cheaper and simpler to prepare – open packet, drop into pan with onions… ahhh! Our problem when we first moved to France was lack of funds. We were living off savings since we knew it would take a year or two to get the new business up and running, so until then every centime counted. We were in the land of haute cuisine yet living off cheap supermarket brand junk food – which yes, France has in abundance. But we survived and are now self-sufficient in poultry, eggs, pumpkins and leeks and glean huge amounts of fruit out of the hedgerows in the autumn. So we’re definitely eating the best we’ve ever done in our lives these days, thanks to becoming expats for the second time. Pumpkin soup anyone? Wow, I have to admit that does sound good. Has my mouth watering even! I imagine it’s been a lot of effort to set all that up. Worthwhile for sure, now that you have access to so much home grown produce, but I know I’d never have the discipline to do something like that. And my back yard (in Perth, WA) is pretty much sand… luckily there’s a drive-thru at the end of my road. Trade you a Pumpkin Soup for a Slushi? This is one of those questions that is similar to the oft-asked “Can you live cheaply in (fill-in-the-blanks country)? The answer– It depends. For example, my husband and I live in Uruguay, in a small beach town called Atlantida. We live well within our means, Had we chosen the beautiful people’s town of Punta del Este, our decision would have been a means to an end of our expat lifestyle. The same applies to eating. Here we are in the land of beef, dairy, eggs and may, and the infamous chivito: A plate of french fires with a slab of meat, covered with a fried egg, lots of cheese and mayo. On the other hand, you can go to the feria on Thursdays and get the freshest vegetables possible, at unbelievably low prices. The veggies are so good that we often get red pepper cravings in the mid-afternoon!